This is a time lapse construction video tutorial that is based on constructing a pool in ground from start to finish. Generally, there are three types of pools like concrete, vinyl, and fiberglass. Among them, Concrete pool is most durable. Concrete is often known as gunite. In fact, gunite is actually the method that is applied to develop a pool shell with concrete. The problem can arise with mold and algae in a concrete pool if proper maintenance work is not undertaken. In order to retain algae from forming and sticking, an acid wash is necessary in each 3 to 5 years as it will strip a small layer away, the shell should have been re-plastered at some point. A small pool generally measures about 10x20 feet and isn’t too deep, about 5 ½ feet. They are used mostly just for cooling off on hot days, but many can be fitted with swim jets for exercise. An average size swimming pool is around 14x28 feet with a typical depth of around 6 ½ feet, but if you intend to do any head-first diving, the Red Cross recommends a depth of at least 9 feet. Pools are considered large at around 18x36 feet. Many have deep ends of 9 to 12 feet. • Shape – Generally, the pool is shaped like rectangular or kidney bean. • Spas – A hot tub is a useful feature for pools. • Slides – Pools often contain slides. • Rocks – The rocks are available in natural stone and artificial stone. • Lighting – Lighting can enhance the look of the pool and applies some safety measure for your pool if you use it after dark. Conventional incandescent light and energy-efficient LED lights are generally used. • Waterfalls – Waterfalls are also gorgeous features on any pool. • Diving Boards – For a large and deep pool, a diving board with a fiberglass model along with a high end aluminum can be set. • Decks – A basic concrete deck with only a basic design can be set up in your pool. • Plants – Plants specifically leafy plants can set around your pool. Leafy plants will drop their leaves, which could blow into your pool. 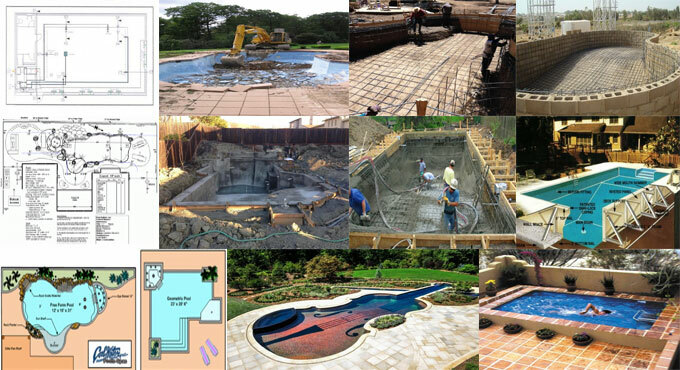 To learn how a pool is constructed, go through the following construction video tutorial.